I met Alexiou Gibson at the Mobilize.org conference in June. In an instant I could tell I was in the presence of someone with incredible heart, determination, and intelligence. 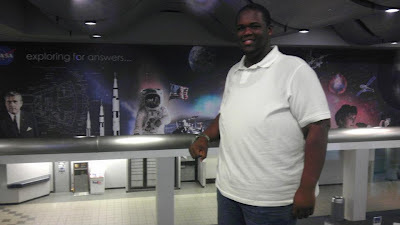 We recently had a conversation about the intense obstacles he's had to overcome in his college life, and what he did to lose 210 lbs and get a coveted NASA internship. 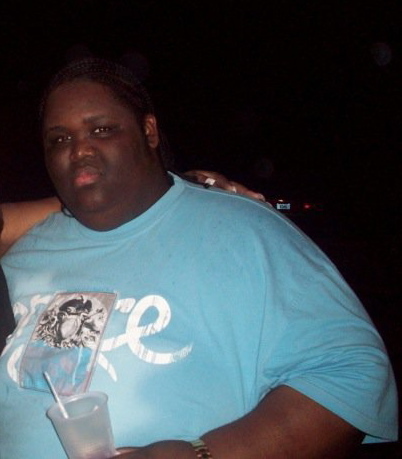 I was born and raised in the Bahamas, and was always overweight. When I graduated High School I was 520 lbs, my highest weight. Basic things like fitting in a classroom desk were huge obstacles, but I would still go to class everyday, squeezing into desks. I was also diagnosed with sleep apnea because of the weight, which cut my sleeping time in half. My grades suffered because it was so difficult to stay awake. Then, one day my doctor sat me down and was very harsh. He said, 'Look, you’re not going to live to see 30, your dream of being a doctor is not going to happen. He was so frank with the reality of my future: 'You are going to get diabetes. You are not going to live past 30.' It was a rude awakening. What made you decide to attend community college? Since I had a lot of health problems after High School, I needed to stay close to my mom and my doctors. I also felt like a number at big universities. At Palm Beach State College, people smiled and made me feel like I was the only student that mattered. It was the family atmosphere drew me in - I felt like I was a part of something. But when I first came to Palm Beach State, I was kind of in my shell. The President of SGA used to bother me every single day about coming to a meeting. I kept saying I would go but never went. I finally went to the very last meeting that semester, and it changed my life completely. The following year I got really active in Student Government, Black Student Union, Math Olympic League, PBL, PTK, Saving Our Sons (The College President's group for minority males). I was at school 13 hours per day. Did you have a job while doing all of this? Yes! I lost my financial aid because of my health issues. Every single class I took was paid out of pocket. 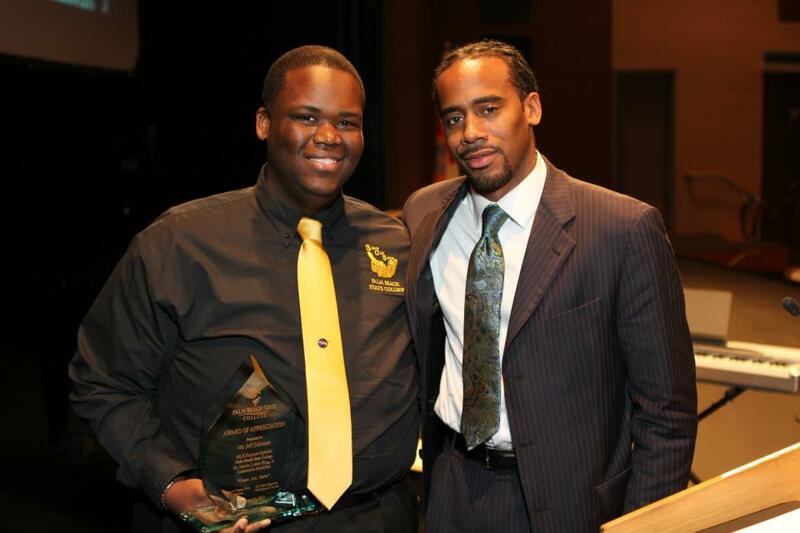 Once I got involved with SGA I met the SGA advisor who became my mentor. She saw this leadership quality in me that I didn’t see in myself, and would lead me towards opportunities. 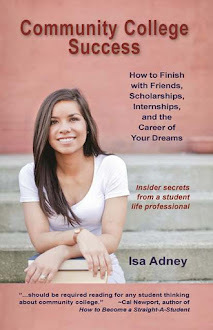 She helped me get a job working 20 hours per week, driving students around campus in a shuttle. That’s how I paid for classes. How did you end up losing the weight? After the wake-up call from my doctor I started making small steps. Everything didn’t change overnight and it took me a while to break my poor diet. But the first big step was using the Palm Beach State College gym. I worked out four hours per day, before class and after class. All of a sudden, the gym wasn’t this dark mysterious place - it actually became a fun place to let off stress. It became a home for me. Watching shows like the Biggest Loser was also a huge inspiration for me. Palm Beach State's Wellness Director also became a mentor and offered great tips like keeping a food journal and how to count calories. As a math and engineer guy, I got so good at counting calories that I could look at a friends plate and say what the calories were. Friends would look at me ‘what are you?’ lol. It was like a game to me. Everything I needed was right on campus. It was so convenient. All throughout the process I had regular check ups with my doctor. Pretty soon, all signs of diabetes disappeared and my sleep apnea went away. I shed 210 in 16 months. How was school going during all this time? School was amazing. I was getting straight A's. During the time I was losing the weight, I was having a perfect semester - getting all A's in classes like chemistry and calculus. It was 2 weeks before our finals; I woke up throwing up non-stop. I called my doctor and he said I was having signs that my appendix was ruptured and needed to go to the ER. I had an immediate operation to have my appendix removed, and during surgery, they also found a hernia that had developed in my stomach from squeezing into desks all those years. It would have become cancerous so they removed it immediately, and I was hospitalized for a month. I missed all of my finals, and my perfect straight-A semester became a straight-W (withdraw) semester. I was going to have to start all over. How did you manage to stay so determined through all of these obstacles? My mother and grandmother kept me going. Every day of my life they told me “You’re bound to do something great Alex. You have the personality, you have the heart." Those words meant a lot to me, as internally I was always beating myself up, thinking I wasn't smart enough. But their words were like always having that nagging parent in your ear, in the best way. My mom would also always say, "If you are a garbageman, just be the best you can be." Seeing how hard my single mom and single grandma worked to raise me, I wanted to pay them back. If all they are asking of me is that I be somebody, give my best, then that was how I was going to repay them. How did you get the NASA Internship? After the surgery I continued on the right track - losing weight and focusing on my grades. One day my student trustee at the college said I should apply for this NASA internship, but deadline was in 2 days. I decided to dedicate myself for the next 48 hours to applying for this experience. A month later I got a big red bold email that said ‘congratulations!’ I got the internship and NASA would be flying me out to Alabama to build a prototype rover for Mars with a $125 million dollar budget. I called my mom and was screaming and crying over the phone - I couldn't believe I had gotten it. It was already a big deal to me, but at the time I didn't realize how big of a deal it really was until my phone started blowing up with with calls from TV and news reports. My mom was even getting calls! What did you love most about the NASA internship experience? The highlight for me was meeting up with other students who were also very interested in the same thing I was. We had so much in common. At first I was doubting myself as usual. But when it came time for our group to chose our presentation leader, they chose me. Note from me: Under his leadership, Alexiou's team scored 27 out of 28 on their presentation; the other groups scored between 10-12. Where can readers apply for this internship with NASA? Its called the National Community College Aerospace Scholars (NCAS) program. I've actually already helped two of my friends get in by showing them the steps to apply. If any of your readers would like advice on the application, they can definitely e-mail me at alexiougibson@gmail.com. Alexiou just graduated from Palm Beach State College with his AA, and was awarded the Martin Luther King Leadership award. He is heading to the University of Florida this August to complete his BS, and then plans to graduate with his Masters of Science in Biomedical Engineering or go to medical school. While in his undergrad, Alexiou will take advantage of the co-op opportunity offered to all NCAS scholars. Over three semesters, he will work a paid internship with NASA for college credit, and is guaranteed a job with NASA when he graduates. What do you hope to do after all of this? Ultimately, I want to become a doctor and do research. I’ve always had an inventors mind, and my goal in life is to leave something that can change mankind for the better (e.g a better catscan, a better prothsthetic). I want someone to be able to say 'Alexiou invented this and my life is better because of it'. Alexiou has been asked to share his motivational story at high schools in his local area, and you can contact him about speaking at alexiougibson@gmail.com. You can also check out his YouTube channel. Wherever you are in your life, I hope you are inspired by Alexiou as I was. His story speaks for itself. In three words - never give up.